Easy Self Assembly - Full Instructions are Provided. Rowlinson Eaton Summer House: Features an overhanging roof and attractive roof bracket detailing is an exquisite feature in the garden. Includes double doors, sturdy tongue and groove roof and floor boards and toughened glass. 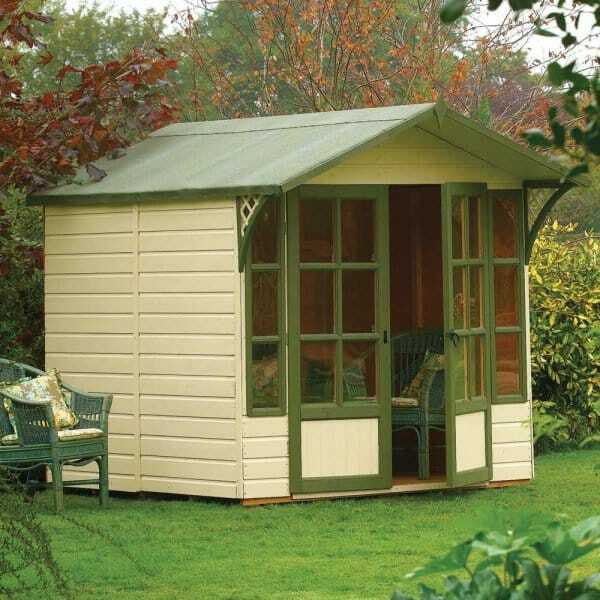 This traditionally styled summerhouse creates a discreet but welcome sanctuary in any garden scene! This picture shows the Eaton painted in cream and green. This is for photographic purposes as an example only. The building is suppliued with a honey-brown finish. Showing 2 of our total 3 reviews, with an average rating of 5 stars. Read all 3 reviews for Rowlinson Eaton Summer House with Canopy Roof.